Update: inbound marketing blog writeup with more pictures and a video. So today at 4pm we started broadcasting HubSpot.TV, as we do every Friday. About 15 minutes into the show, I notice this guy standing next to me, so I say hi and introduce myself. He says “Hi, I’m MC Hammer.” So I say nice to meet you, and go back to my business. 30 seconds later I realize that holy *$#!, it might really be MC Hammer! 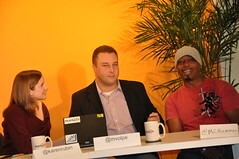 60 seconds after that, he’s on the set with Karen and Mike, talking about user-generated content, social media, Twitter, blogging, and other internet marketing topics. It was kind of insane. MC was friendly, courteous, professional, and very knowledgeable. Going all the way back to 1995 and SGI (Silicon Graphics), to blogging the last 4 years, to his brilliant use of Twitter. I was pleasantly surprised by his level of knowledge and thoughtfulness. It was truly a pleasure to have him around. First the Governor of Massachusetts (Deval Patrick), now MC Hammer. Who’s next on HubSpot TV?